My experience with orange wines has been quite limited in the few years. Frankly, I have only tried certain bottles from Friuli, the Rhone and southern France. So when i came to know that one of my favorite wine importers was carrying the orange wine of Ambiz, I jumped right away and bought me a case!!. Ambiz is imported by Glou and you can get his wines by the case of 6 for a price of less than $30. Fabio Bartolomei has been making wine since 2003 in the upcoming Sierra de Gredos in Spain. A passionate wine lover who discovered natural wines by accident, he makes barely 8000 liters from 3ha of vines. A true artisanal producer, whose wines are rapidly attaining cult status. He makes many micro-cuvées from his vineyard collection. Fabio can be described as natural wine producer: He grows organic grapes and uses little or no sulfites at all. 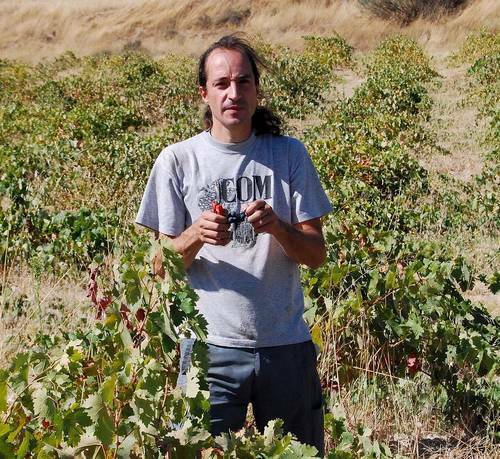 He tends five vineyards that are located in villages close to Madrid and Sierra de Gredos. These are: Carabana, Villarejo, Chelva and Sotillo de la Adrada. To makes his wines, he rents a wine facility in El Tiemplo who has a capacity of 1.5 million and was abandoned. He is giving it a very good use. Alba 2016 has a tiny production of 2000 bottles and the wines is born from the soft slopes of the Sierra de Gredos. Fabio press lighty with a short maceration and aging in Amphora. Delicious nose. Complex earthy nuances, lemon jelly with orange marmalade, white flowers and spices such as saffron and white pepper. Bright and very round ( A polished tannic sensation in the wine) with lots of confit citric fruit character such as grapefruit peel. Pleasant and very clean aftertaste, bringing to mind lime, chalk and Ricola candy. Definitely a buy by the case wine. What to eat with Ambiz Alba Orange wine? I really enjoyed the Ambiz Alba with some chicken empanadas Venezuelan style. For me, the Ambiz complemented rather than dominated the flavour of the Empanada. This can be described as a seasoned chicken with cumin and cilantro with the taste of fried corn dough. But definitely, it could pair well with other dishes of Venezuelan gastronomy such as Pabellon Criollo for instance. Spanish orange wines are a still a mistery to me and hope to continue my learning experience with them. Do you have any favorite orange wine producers in Spain?. I am waiting for your reccomendations.